I should never have gone to this game, so I’m going to have to write a rockin’ blog post to make up for it. 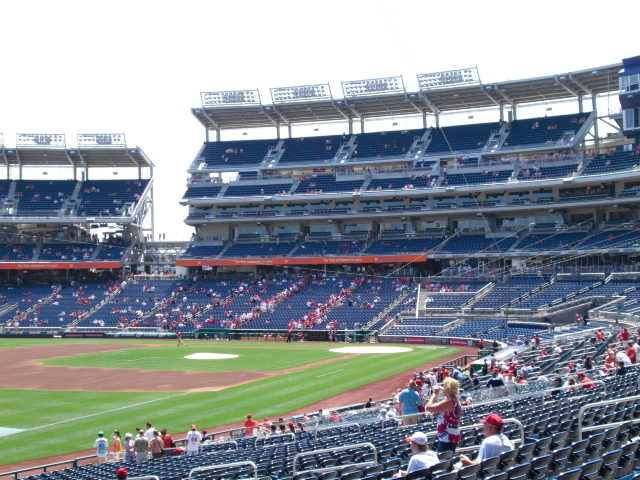 The Marlins and Nationals were playing a weekend series in D.C., and I normally go to evening games. However, I was otherwise engaged during the Friday and Saturday match-ups, leaving my only options to attending the Sunday game or not attending at all. 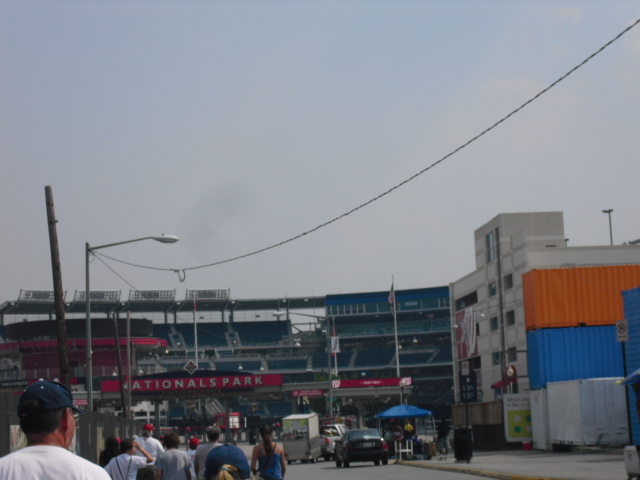 In the history of Nationals Park, I have attended at least one game in every Marlins-Nats series with the exception of just two. I did not want to make this my third, so I pressured my dad into going. It was Michael Morse bobblehead day, so I had bait to my argument. Long story short: Apparently one scalper got offended when another scapler bumped into him while I was consulting them. A feminine screaming match ensued and we just walked away. The whole affair was sad and comical. I despise how aggressive the scaplers are. Some of them seem to think that “club level” refers to anything above the lower bowl. And some call anything to the left of home plate “third base side.” Anyway, we had to go to the box office. To make matters worse, the day of game pricing per ticket is significantly more than the online pricing. So at almost $40 per seat, we got tickets on the left field line. I don’t think I am ever going to go to a Sunday day game again because it was so crowded. There were several reasons why it was so packed. 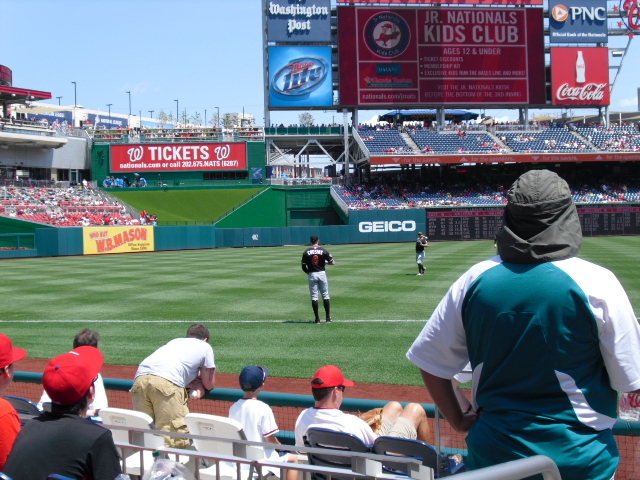 First, it was of course a Sunday day game, meaning everyone was free to hike up to D.C.. Second, every Sunday home game is “Signature Sunday,” meaning two Nationals players (normally mediocre pitchers or bench players) sign autographs atop the dugouts for 20 lousy minutes starting at 12:25. Also, the Michael Morse bobblehead giveaway added to the crowds, as did the fact that the Nationals are in first place. An overflow of people means an overflow of kids; that, coupled with the lack of BP, decreases ball snagging ability for a tall teenager like myself by about 99%. (I’d like to see a Sports Science episode on the competition factor). All I wanted was one of those commemorative baseballs. I didn’t care about anything else, so I was ecstatic when I saw the magical logo on the ball that was dropped by Reid Cornelius. He was playing catch with Mike Dunn on the right. Wade LeBlanc and Chad Gaudin were throwing on the left. Dunn and Cornelius finished first, so I separated from the crowd and estimated I had a 50% chance of getting their ball (because I was one of two fans in the section wearing Marlins gear). Dunn tossed the ball to the other kid with a Miami hat. That was my best chance. The ball LeBlanc and Gaudin were using was not commemorative, and LeBlanc just tossed it back into the ball bag when he was finished [most likely an order from Randy St. Claire who had already seen one too many balls given away (in case you’re unfamiliar, St. Claire does not acknowledge the existence of fans and I’ve never seen him smile…Randy, I hope you’re reading this)]. 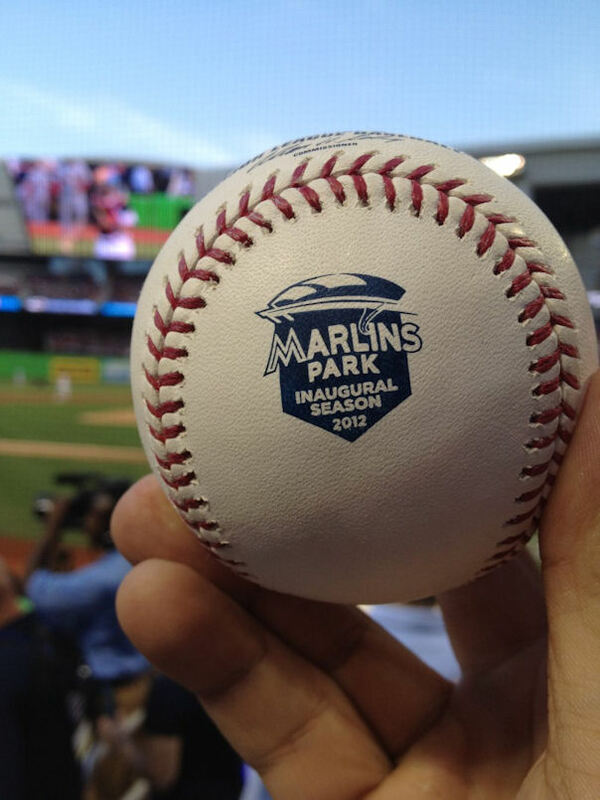 Seriously, Marlins, you don’t have many fans, you can’t afford to lose the ones you do. 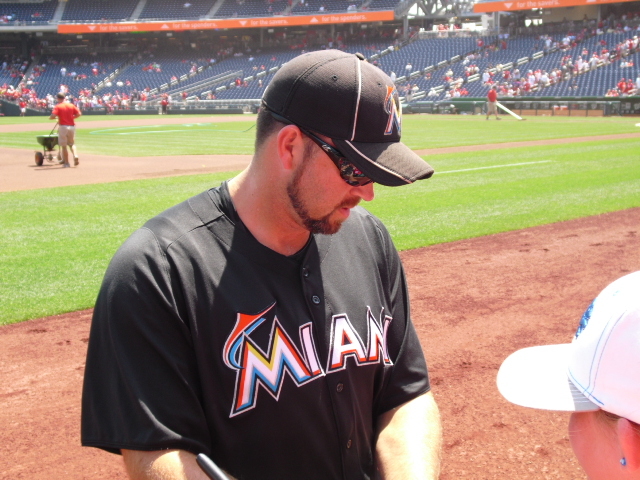 Heath Bell then signed autographs, but he had no baseballs on him, so I just listened to him amusingly argue with a little kid about bobbleheads. He said he has never had a bobblehead because only superstars get bobbleheads and he is not a superstar (boy, do I agree with that!). 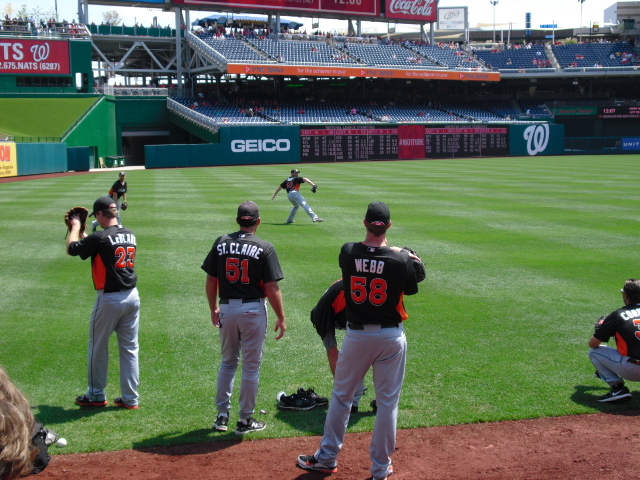 The few Marlins on the field vacated the premises soon after, and I was left to bake in the sun. Before first pitch, Bryan Petersen and Scott Cousins came out to throw. As did Gregg Dobbs and Justin Ruggiano. Petersen (maybe is was Cousins) tossed the ball to a kid in the front row (I was back a few rows), and Dobbs handed his to a small kid far away from where I was. Donovan Solano also had one, and when he finished throwing with Jose Reyes, he signed it and gave it to someone he knew. The only way things could have been going worse for me was if I had developed melanoma while sitting behind the dugout. 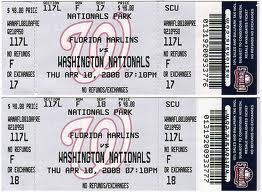 In 2008, the inaugural season of Nats Park, the Marlins took 7 of 8 games from the Nationals. The Fish took 5 of 9 in 2009, 7 of 9 in 2010, and 7 of 9 again in 2011. 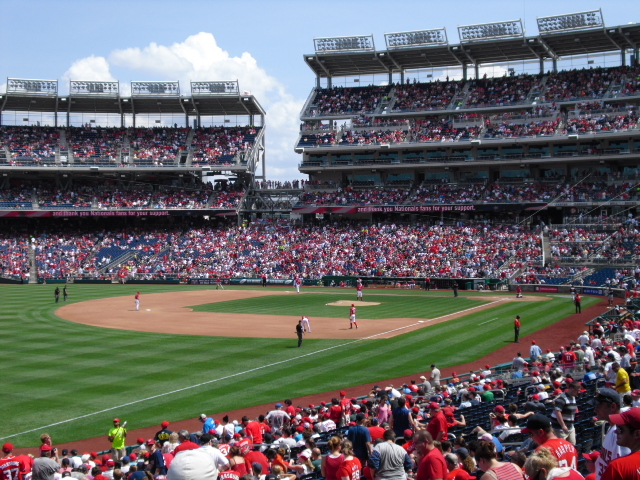 This is the first year that the Marlins do not have a winning record in D.C..
All that success does nothing to change what is happening in D.C. right now. Maybe if Miami’s front office had been patient with their developing players, they could be winning right now as well. Never before have I ever seen the Marlins offense so stifled than in the games this year in D.C.. Stephen Strasburg turned the tables on the Fish and shut them out through six innings. Strasburg also plated two runs, during a four-run second for Washington, by singling to right-center. The most exciting part of the game for me was seeing Danny Espinosa get plunked. The previous night, the Nationals had come back to tie the Marlins when Espinosa busted the game open with a monster three-run blast. The little show boating that Danny did as he circled the bases coaxed Ozzie Guillen to order Ricky Nolasco to throw at him in his first at bat on Sunday. To my disappointment, things did not escalate any further. 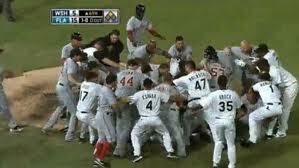 There haven’t been any good fights in Major League Baseball this season. I feel obliged to defend Randy St. Claire. He’s a pretty nice guy, and he’ll toss a few up every now and then. Having gotten a commemorative from him, I don’t really know why he has such a negative reputation. He also engages the fans in conversation….a nice guy in my view. Sure, he might not be the most actively – fan friendly guy in baseball, but be patient with him and it’ll pay off. He is a nice guy, and I did have a good experience with him when I went to spring training in 2010. But when I have seen him at big league ballparks, at least from my experience, he seems to not want anything to do with fans. I’ve never seen him converse with fans, only blow them off, but I appreciate your feedback. Hopefully, I’ll see the good side of him in the future.